If calling after hours, you cannot leave a message. Please call during operating hours to get fine information. PLEASE WAIT ONE WEEK AFTER YOU RECEIVE THE CITATION BEFORE CONTACTING THE COURT. WALKERTON COURT WILL ACCEPT PAYMENT BY MAIL, IN PERSON, OR ONLINE PRIOR TO YOUR COURT DATE. IF YOU DO NOT CONTACT OR APPEAR IN COURT, YOUR LICENSE WILL BE SUSPENDED. IF REMITTING BY MAIL, ENCLOSE A SELF ADDRESSED STAMPED ENVELOPE AND AN OFFICIAL RECEIPT WILL BE MAILED TO YOUR PROPER ADDRESS. 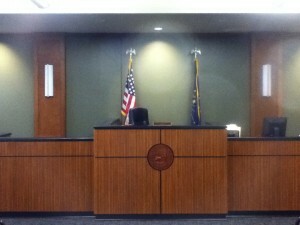 MONEY ORDERS OR A CASHIERS CHECK SHOULD BE MADE PAYABLE TO WALKERTON TOWN COURT. PLEASE INCLUDE YOUR NAME AND TICKET NUMBER ON THE FORM OF PAYMENT. PERSONAL CHECKS ARE NOT ACCEPTED. If you plan to come to the court office to pay a ticket that was issued before 2014, please call ahead of time. Older tickets have to be entered into a new computer system. By calling in advance, you can reduce your wait time. We cannot take credit/debit card payments over the phone. For your convenience after hours, there is a payment drop-box on the front wall of the building and a drive-thru alley.